For any visitor who has time for only one meal in Istanbul, I would recommend going to Pandeli. Located in the Misir Carsi (Spice Bazaar) in Istanbul, Pandeli Restaurant, has to be one of the best experiences for Turkish food. Everything about it, from it's amazing location, great views, impeccable service to some of the best food of it's kind are all to be found in this restaurant that I count as one of my favorites in Istanbul. The menu is not only fantastic but innovative as well. You can find most of the traditional Turkish dishes but some like the donerli patlican boregi (eggplant pastry with Doner Kebab) is something that I have only had here. It is also one of their most popular menu items, tending run out rather quickly, so as soon as I come into the restaurant, I always ask for it along with their 'out-of-this-world' bademli kurabiye (almond cookies). 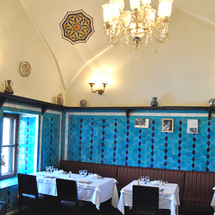 The ambiance is fabulous, situated above the front entrance of the Spice Bazaar, overlooking the Golden Horn on one side and the bazaar on the other, it has a story book feel to it. You enter through a door inside the bazaar and climb up a steep flight of stairs to arrive in domed, blue and white tile covered rooms with tiny windows. Each of the three dining rooms has only a couple of tables, adding to the cozy atmosphere. Service by the older gentlemanly waiters is impeccable, giving one the feel of a home-coming. Every one who walks in through those doors is treated with warmth and attention almost like a long lost daughter. Reading through their website, I realized the reasons for this, since their chefs have been with them for the past 45 years and they were trained by the chef who worked before them in Pandeli for 69 years - they say the staff does not easily change at this culinary institution. They have a great website that has wonderful photographs of the restaurant, it's famous clientele and food, but, unfortunately it's only in Turkish. I will try to translate it to the best of my abilities here. This restaurant was listed in Food and Wine Magazine's top 20 taste cities in the world, and the New York Times travel section. I wish everyone a chance to indulge in this Istanbul classic that is a feast for all the senses. I try to stop by whenever I am in this neighborhood for at least tea and almond cookies by a window with a view of the Galata Bridge... some of my favorite zesty moments.